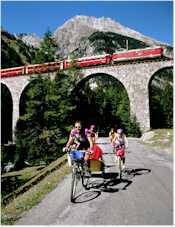 LEFT: Cyclists share the Albula Pass in Graubünden with a train of the narrow-gauge Rhätische Bahn. The districts best adapted for cycle-tours in Switzerland are the hill-country in N. and W. Switzerland, the lake-regions of Central Switzerland and the Bernese Oberland, and the environs of the Lake of Geneva. No one who is not fairly strong and in good condition should attempt the Swiss passes or mountain-roads. In any case the machine should be well-tried and trusted rather than new, and the brakes must be powerful and reliable. The practice of tying a branch or sapling behind the cycle to check its velocity is forbidden. Herr Baedeker's advice is still applicable today, although the development of mountain bicycles has made alpine biking less stressful than it was early in the last century--and it's unlikely that many of today's cyclists are sacrificing tree parts in the interests of better braking. Bikes rented for a day or more can be returned to any participating station for a modest service charge. This makes it easy to plan tours across a region, along a lake, or over a mountain pass without having to backtrack. You can also rent bicycles at some 100 hostels and campgrounds across Switzerland, although these bikes must be returned to the rental locations. Finally, urban bike-sharing programs such as Publibike are being rolled out gradually across Switzerland. When your legs need a break from pumping the pedals, you can check your bicycle on most trains for a modest fee. You can even send the bike ahead and pick it up a day later. It's easy to bike on your own in Switzerland, whether or not you speak the local language. Roads are smooth, the country is criss-crossed by a network of well-marked paths, and maps are easy to obtain in bookstores and tourist offices. Still, if you like the idea of traveling with a group or letting a professional do the planning, see the list of Web links for tour organizers on page 2 of this article.